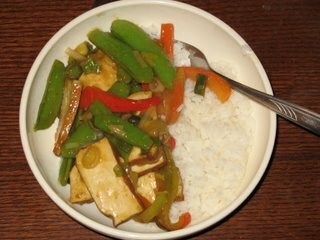 Last night I made a passable stir fry with some tofu, baby leeks, red bell pepper, and sugar snap peas. The sauce had some fresh squeezed OJ, agave syrup, soy sauce, garlic, cornstarch... it was okay. 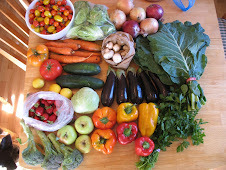 The tofu wasn't very good, unfortunately, so we ended up picking out the veggies and eating those. All in all, it was worth eating, but not worth repeating - although the picture sure turned out pretty. Tonight I got home late from teaching and was so happy to see that Musty had bought me an Amy's cheeseless pizza. Hoorah. I was gluttonous and ate the whole thing! Ooops. These things are so darned good. 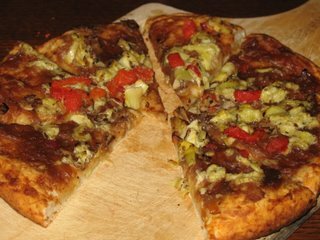 I've also tried their new vegan, gluten-free, rice-crust one. It's also very good, but it's really full of fat - so I prefer this version. Also, I thought I'd share one of my most favorite holiday season crafts... paper snowflakes! Even though all you need is a good pair of scissors and some typing paper, you can make some really beautiful decorations. I made these ones last night and they turned out so beautifully. Then, I tape them up to the windows to make it look snowy (even though it was sunny today). : ) Sorry about the glare off our coffee table, by the way. That's it, I'm making snowflakes! I'm at work and have everything I need, plus tons of time on my hands. Regarding the tofu, did you fry it or bake it first? It looks like it might need that? Try marinading it in soy sauce and agave and garlic before hand? Hmmm..the stir fry still looks very fresh and tasty. Those snowflakes look amazing! I use to do that when I was a kid. Thanks for reminding me to do it again. Did you iron them after? they are so flat! Cool! I like picturing you snipping away at work... happily making snowflakes. :) Tofu-wise, it was actually some baked tofu that I got at our farmer's market, and I was under the impression that it was marinated already. It wasn't (or at least not to a perceptible degree) and it was also sort of rubbery. Just not a hit. I dream of having tofu as scrumptious as yours always looks... so I'll keep perservering (& marinating!). Snowflakes are so fun! I don't iron them (although that's a good idea) I just unfold them and pat them down a bit. I sometimes leave a book sitting on them overnight before taping them to the window. Oh those snowflakes are amazing! I can't believe just you and a scissors made that! Your snowflakes are beautiful! I tried making some the other day after I remembered making them as a kid, but mine didn't turn out nearly as intricate. How many times did you fold them before cutting? 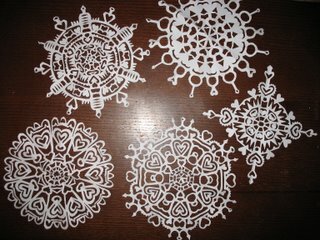 I will have to practice now that I see the high standard of snowflake-making that has been set! Holy crap those are good paper snowflakes! Impressive! I folded them different amounts... The smaller one on the right was folded in half twice (quarters). Two of the others were folded in half 3 times. Then, my boyfriend told me that real snowflakes are always hexagonal, so I tried a couple folded into 6ths (fold in half once, then into thirds). Those ones turned out great, but folding into perfect 3rds is hard to do. 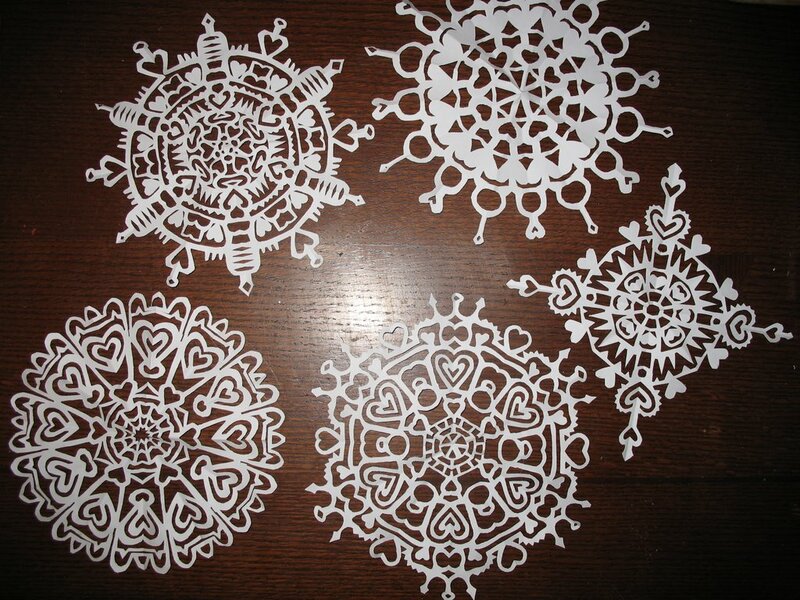 To make them more intricate, just keep cutting out as much paper as you can. Even things that look so weird and crazy will be beautiful once you unfold them. Have fun! You are so creative. I'm very impressed. They remind me of the tart you decorated with chocolate. I think you have the same tofu folks at your farmer's market as we do in Berkeley. I always buy the blocks of soft tofu, which I just love, but last time I went they suggested that tofu that you got. I don't think they have had that kind for long, and the person working at the stand seemed a bit confused about it. I finally figured out that it was FOR baking and not actually baked yet. I also had an experience recently with some other tofu bought at the store that ended up being slightly sour. Blech, I was picking it out just like you. Hi Amey, I am interested in learning about yoga (I am a new beginner) and finding a way to incorporate it into my daily life. There is an upcoming class in my area called the Seven Spiritual Laws of Yoga based on the same book by Deepak Chopra and it is taught by a teacher who has been certified by the Chopra Center. Do you know anything about this? Would you recommend it? Thanks! :) I'm sure you could make some fancy ones too... just takes some good scissors and some perserverance. It's funny, I didn't even realize how similar it was to the tart - good catch! Also, regarding the yoga course, I don't know anything about Mr. Chopra's concepts or theories behind yoga... but I think he's generally a pretty good guy, so it probably won't hurt you! I think it's really exciting to learn as much about yoga as possible, and then you gradually find the aspects that resonate most deeply with you. So, if you think the course sounds interesting and you can afford it, sounds like a good idea. You might be able to call the teacher ahead of time and see what sorts of things he/she plans on covering - whether it will be lecture or discussion or postures... I'd be curious to hear about it, if you take it. Thanks for the cool snowflake link! Fun! Ugh, yucky sour tofu is such a drag. Yeah, that baked tofu was a bummer. I like getting stuff at the farmer's market, but I think I'll skip that baked tofu next time. Although their tofu-cilantro salad was amazing. So maybe I'll try some of their more prepared foods. How in heavens do you succeed making such wonderful snowflakes with scissors ? You have fairy hands, for sure ! I love your snowflakes... I could never be that intricate- I agree with Crystal, they remind me of your decorated tarts, and I agree with Gaia, you have fairy hands! Thanks for the reassurance that I'm not the only one eating the whole pizza! :) It's true that they're pricey... good thing Musty got it for me! Since I'm actually a "Flake" I'm going to have to try to make these. But I doubt they will turn out so well, as I'm also a clutz! thanks for the funny comment Kathy!